With the first hints of turning leaves in the air, I start to relax. The smell of autumn is a welcome reminder that the long, busy days of summer and early fall on the farm do draw to a close. The farm has been a flurry of activity this year. 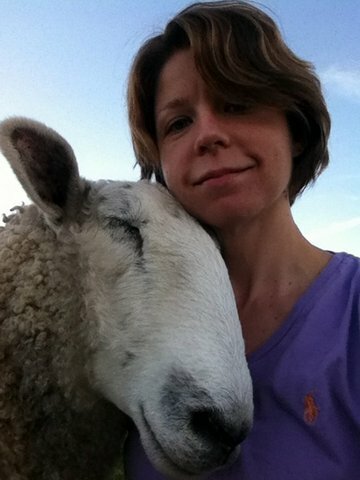 We built a new barn for the sheep this spring and have been renovating fields and pastures. The lambs born this spring, which you can see here, are growing and are also enjoying the cool evenings. 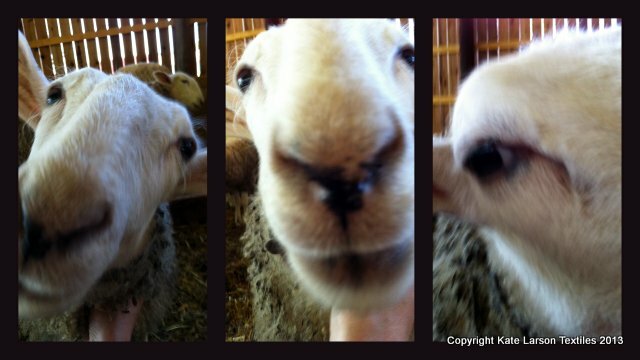 This is what I usually get when I try to take pictures of the lambs. Here is Erlend, who is refusing to stand three feet away from the camera and strike a charming pose. Gerald is a more calm and peaceful fellow than his namesake in Women in Love. Due to the pasture renovations, most of the sheep are in the new barn this fall. It is big and airy and sunny, but they would much rather be out of doors. Luckily for them, we have a bumper-crop of Giant Ragweed this year. In the evenings, I drag a dozen of the six-foot weeds into the barn, to the great pleasure of the captive flock. 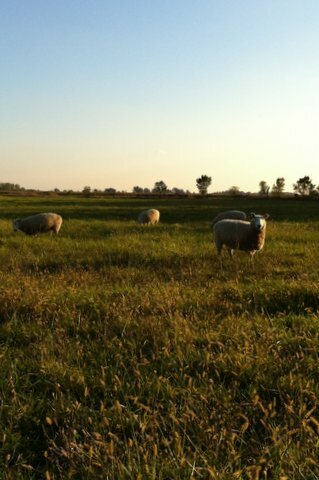 Gerald and his friends are out in a separate pasture and are enjoying the cool evenings. My dad and grandfather renovating a pasture. We are trying a variety of new forages in this pasture renovation. My dad is a Research Fellow at IUPUI as well as a farmer, so these on-farm trials are the result of much study and thought—as you might expect! 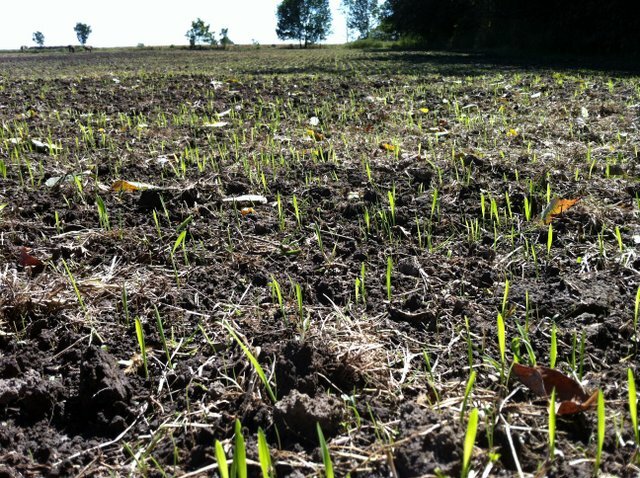 This field was the first cleared on the farm toward the end of the 1800s—a bit late for this area in Indiana. Sitting adjacent to the house and barns, it has always been used for the farm’s horses. I found a horseshoe that was turned up by the tillage. My grandfather said, based on the shape, that it probably belonged to a horse my great-grandfather Urbane called New Deal. 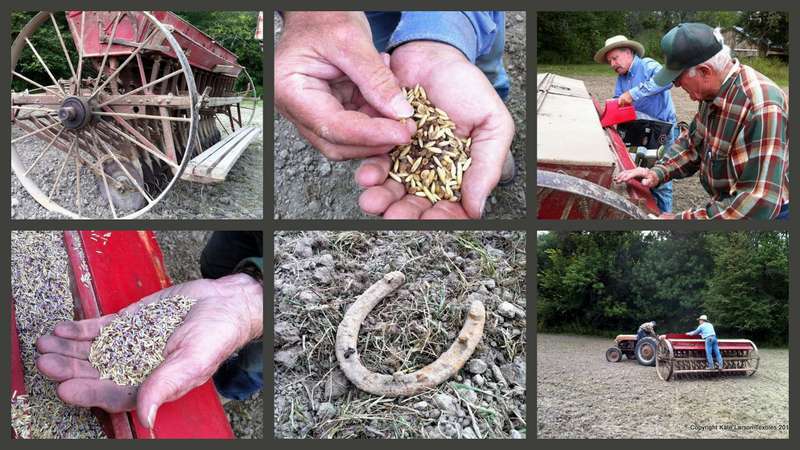 This seeder was one of Urbane’s purchases and the owner’s manual, which is still tucked inside a toolbox attached to the hitch, has detailed instructions on how to connect it to a team of horses. It was very sophisticated when new, and still does a great job. It makes a distinctive, antique sound when in use, mostly due to chains that drag on the soil surface to partially cover the seeds. Renewed and revived. The sheep will enjoy the fruits of this effort next spring. Sue is so sweet and sleepy. Jealous Joan is very busy. Tess is the flock beauty. Thank you for sharing these pics and these stories with us, Kate! Absolutely fascinating for this city girl:) I LOVE IT! How wonderful to be still working the land your ancestors inhabited and find all those reminders! Long may it continue.